Tonight I have my second half of Hare's spring collection called The Last Queen of France, based on the life of Marie Antionette. 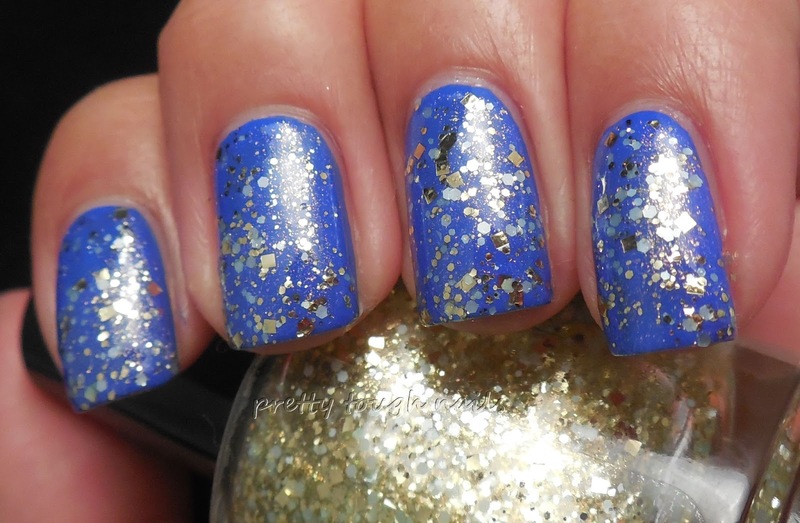 I consider two of the polishes true jelly glitters, Hooky At The Hamlet and Party Palace, and the other two are glitter toppers, What I Wore To The Revolution and Dauphine Of Decadance. The first of the jellies is Hooky At The Hamlet, a seagreen jelly with varying sizes of matte white glitters and tiny squares. 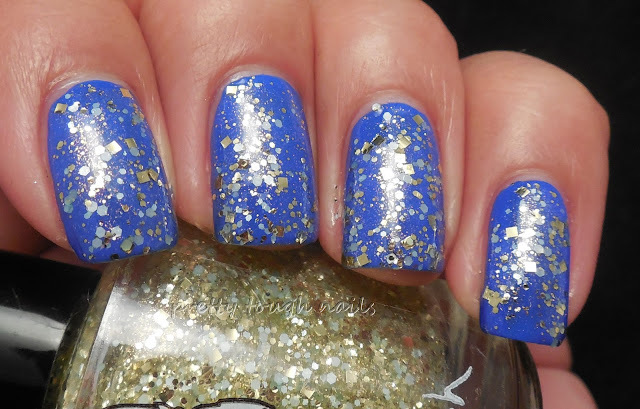 There's also gorgeous blue iridescent microglitter that is really difficult to capture on camera but can be seen in low light. 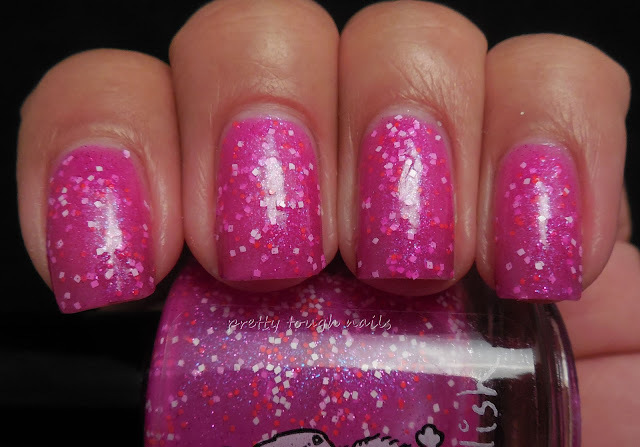 I found the polish to be slightly thick but workable, I used three coats and experience slight dragging of the glitters towards the tip of my nails. The last coat I dabbed at the base and then swiped down the rest of the nail to even out the color. I used Gelous and SH Insta Dri to finish. The second jelly, Party Palace, is similar to Hook At The Hamlet except for difference in base color. 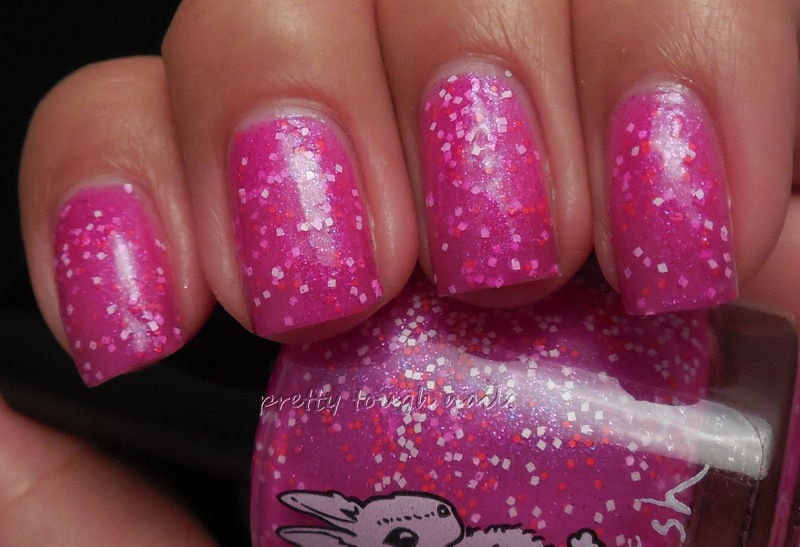 Party Palace is a pretty fuchsia jelly with tiny matte white squares and fuchsia hexes. 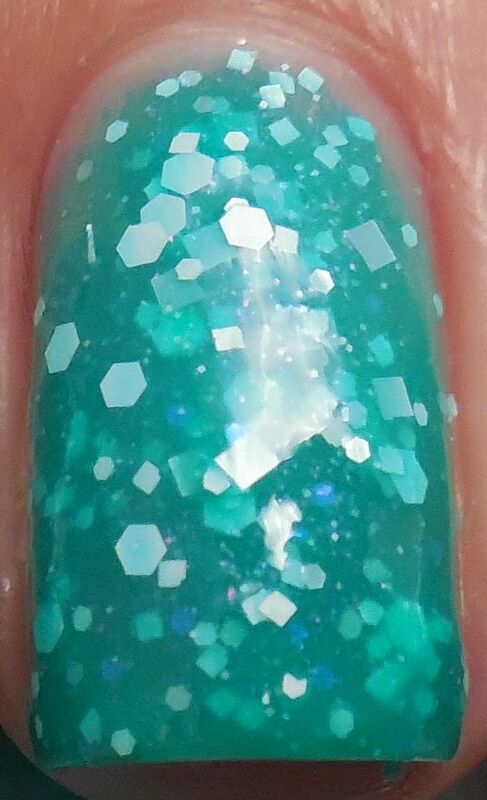 This has the same iridescent microglitter like the previous jelly. I found the formula to be much easier to use because there was no dragging. I could have gotten away with two coats but used three instead. I only needed a layer of SH Insta Dri for shine. 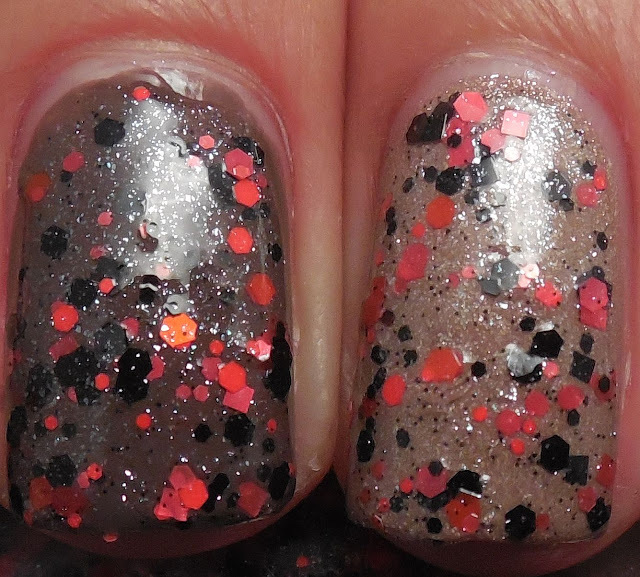 What I Wore To The Revolution is a eye catching red and black glitter topper with silver shimmer in a clear base. There's red squares and hexes and varying sizes of black glitter. I used one layer over two coats of Color Club Positively Posh on all fingers except my ring finger which has Orly Night Owl. The glitters all spread evenly and I got the perfect amount of glitters with each stroke. I finished with SH Insta Dri to smooth and add shine. 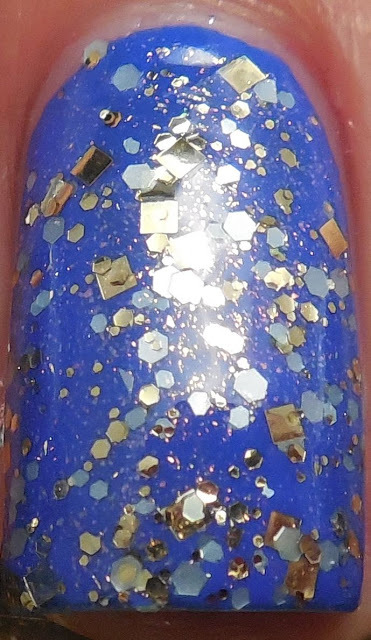 Lastly, I have Dauphine Of Decadance, a regal glitter topper in a clear base that contains varying sizes of matte white, silver, and gold hexes with silver shimmer. I used one coat over Sinful Colors Endless Sea, a one coat cobalt blue. 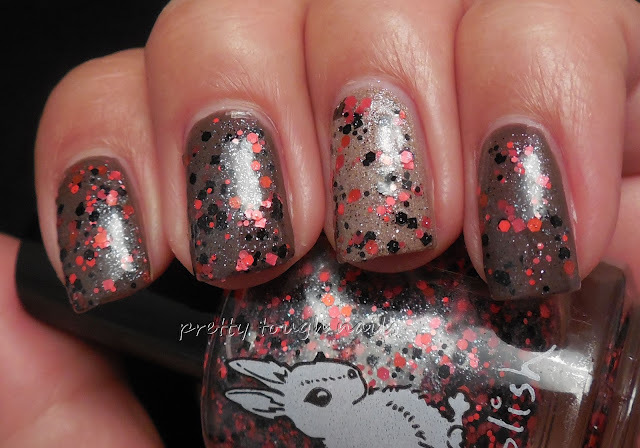 I had no trouble with the formula and the glitters spread evenly on the nail. I got a ton of glitters with each stroke, almost to the point of too much but then again, there's never too much glitter! I finished this with a layer of SH Insta Dri as well. There are three more glitter toppers that I don't have in my possession, The Teen Queen, Own Your Opulence, and Married To The Monarchy. 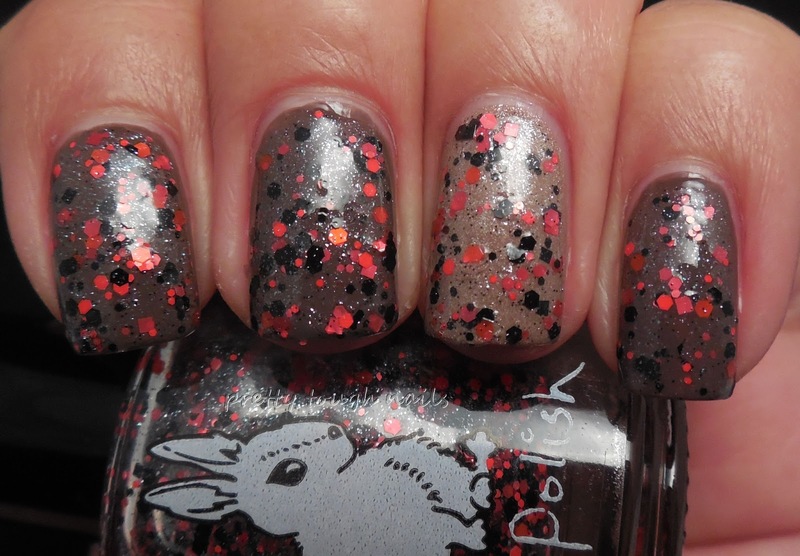 I don't usually like glitter toppers, but after using Hare's latest two, I must say that I feel like I need the rest to complete my collection. Overall, I really loved the theme of this collection and the delicate and regal beauty of each polish. There's plenty of gold, squares, and matte white glitters to keep me happy all season long. If you're interested in any of these, make sure you catch Hare's restock on Wednesday March 20th on Etsy where these will be all listed. Get them fast while you can, because once they're gone, they're gone! Ooh these are all gorgeous! thank you! i love them all! Picking the base colors for Hare's toppers is not always as easy as you make it look, GREAT job! I appreciate the compliment! I agree that it is difficult to find a good base, which is why i usually avoid glitter toppers. I felt these two were neutral enough to go with most colors.